Chocolate Chip Cheesecake Bars with a graham cracker base, creamy cheesecake filling and delicious chocolate chip cookie crunch. Today, I’m sharing one of my absolute favorite recipes. These Cheesecake bars were so good I couldn’t keep them in the house for fear of eating them all by myself! My husband’s work was fortunate enough to get a big plate of dessert at their staff meeting a few weeks ago! Using my favorite chocolate chip cookie recipe and a graham cracker base, I whipped up a delicious cheesecake filling to nestle in the center! 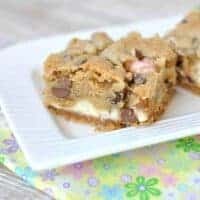 These Chocolate Chip Cheesecake Bars are the perfect way to use up some of that holiday Easter candy too. Toss in a handful of colorful M&M’s candies to the cookie dough for a sweet surprise! Line a 13×9 baking dish with parchment paper. This helps you remove them easily from the pan and cut into nice squares. Set pan aside. PRO TIP: To get the parchment paper to stay in place while preparing the dish, use mini clothespins or binder clips to secure parchment paper to pan. Remove before baking! In a food processor, pulse graham crackers with sugar until fine crumbs. Drizzle in the melted butter and pulse until combined. Pour graham cracker crumbs into bottom of baking dish. Using the palm or your hand, or bottom of a measuring cup, press crumbs firmly into the bottom of the dish. For the cheesecake filling, beat cream cheese with sugar, eggs, and vanilla extract using the whisk attachment on your mixer. Beat until fluffy and smooth, about 3-5 minutes. Pour over graham cracker crust. For the cookie dough, beat butter with sugars for 2 minutes until combined. Add in milk, egg, and vanilla extract. Beat until mixed. Add in flour, salt, and baking soda and mix until fully combined. Fold in chocolate chips and candies. Drop by large scoop onto the top of the cheesecake layer. Try to use your fingertips to gently spread over the cheesecake layer, until completely covered. Bake for 30-35 minutes. Remove and cool completely. Once cooled, cover with plastic wrap or foil and refrigerate for 4 hours or overnight. Use a food processor (or a ziploc bag and a meat pounder) to process your graham crackers into a fine crumb. DO NOT use the store bought graham crumbs. I personally think the flavor of those is “off” and I can tell the difference in the two! Use parchment paper to line your 13×9 baking dish. Not only does it help with clean up…but once these are complete, you can lift the whole batch out of the pan to slice them. This helps keep them looking uniform and pretty (not smashed and uneven). I like to make these cheesecake bars the night before serving. Or first thing in the morning. I think the more time the cheesecake filling has to cool and chill the better they taste! Which makes these perfect for your brunch or family gathering. You can make them ahead of time and have no stress about dessert. And because your cheesecake is covered in cookie dough, you don’t have to stress about cracks in your cheesecake recipe! How Do You Make a Cheesecake Bar? 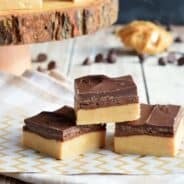 Whether you want to make today’s Chocolate Chip Cheesecake bars or another flavor, I have just what you’re looking for! A traditional Perfect Vanilla Cheesecake is made in a springform pan. But cheesecake bars can be made in square baking dishes or 9×13 pans! So easy to bake and cut! If you want to make life simple, feel free to purchase a delicious, good quality, refrigerated cookie dough for the topping. Homemade is always best, but sometimes fast is better. Chocolate Chip Cheesecake Bars with a graham cracker base, creamy cheesecake filling and delicious cookie crunch. Line a 13x9 baking dish with parchment paper, set aside. In a food processor, pulse graham crackers with sugar until fine crumbs. Drizzle in melted butter and pulse until combined. Pour graham crumbs into bottom of baking dish. Using palm of your hand (or bottom of a cup) press crumbs firmly until they are combined (and slightly hardened) in bottom of pan. For the cheesecake filling, beat cream cheese with sugar, eggs, and vanilla using the whisk attachment of an electric mixer. Beat until fluffy and smooth, about 3-5 minutes. Pour over graham crust. For the cookie dough, beat butter with sugars for 2 minutes, until combined. Add milk, egg, and vanilla. Beat until mixed. Add in flour, salt and baking soda and mix until fully combined. Fold in chocolate chips and candy coated eggs. Drop by large scoop onto top of cheesecake layer. Try to use your fingertips to spread gently until cheesecake is covered completely. Bake in a 350 degree oven for 30-35 minutes. Remove and cool completely. Once cooled, cover with plastic wrap and refrigerate for 4 hours or overnight. Cut into squares and enjoy!! Gotta love Philly cream cheese. These bars look amazing! Pinned. Oh my gosh!! I need to start adding layers of cheesecake to my blondies and brownies ha. These are so fun! Chocolate chip and cheesecake are the best combination! I love the gooeyness. Pinned and can’t wait to try them! Thanks for Pinning Ashley!!! It WAS a delicious combo and I can’t wait to make them again too!! I could definitely dig into one of these right now. Looks so creamy. 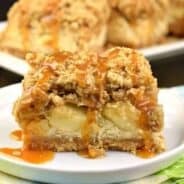 Love adding cream cheese to desserts. This looks so delicious! I can’t wait to try the recipe! Since you know how I feel about cheesecake, it will be no surprise that I freaking love these!!! Cookie and cheesecake is the bomb!!! And with fun Easter colors hiding in there…so pretty!!! Oh my heavens! This looks fab Aimee. Cream cheese for life! These cheesecake bars are going to make my life right! I just know it. They are so perfect! These look incredible! I’m all about the sweets lately, and these lovely little cheesecake bars are calling my name. So delicious and decadent! 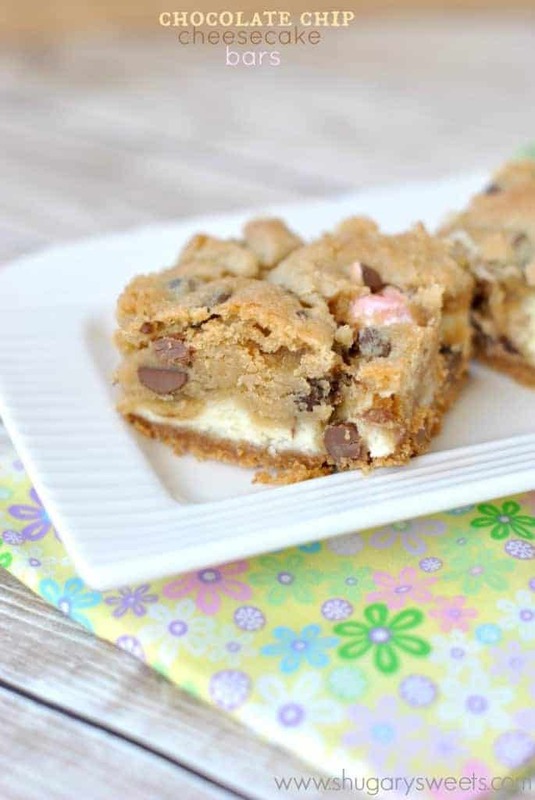 Take two of my great loves, chocolate chip cookie and cheesecake, and throw them together! With big chocolate eggs, no less! You have made me very happy today. These look amazing! Philadelphia cream cheese is where it’s at! These look phenomenal! It’s okay I eat cream cheese with a spoon, right? Lol! Love the stuff and these bars! These are fantastic Aimee! 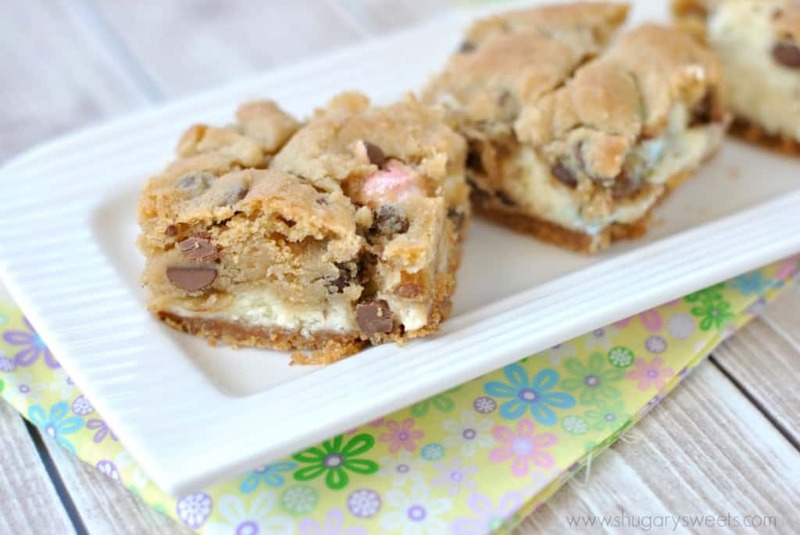 I LOVE cheesecake cookie bars, especially with Easter candy! I need to make my cheesecake. So many ideas….so little time! you are 100% correct. Philadelphia is the best! I eat the whipped cream cheese with a spoon! Wow, I could go for a plate of these and a big glass of milk. I love the cookie/ cheesecake combination. 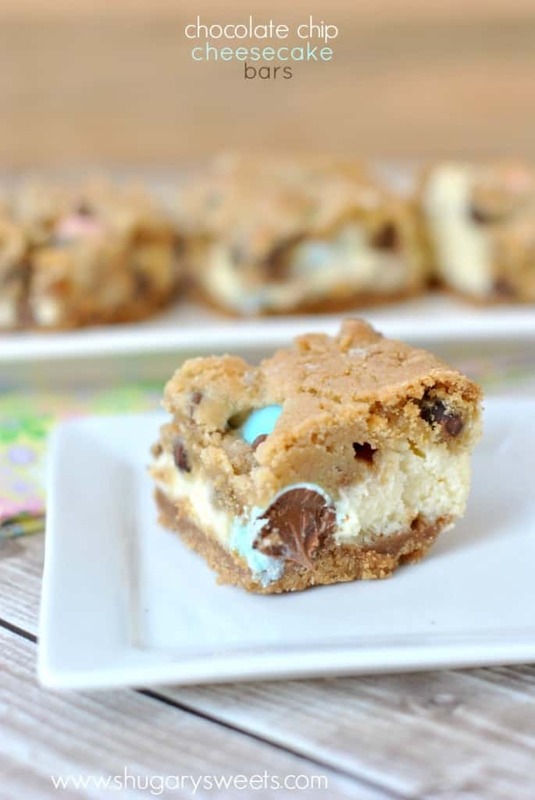 I’ve never mixed cookie and cheecake , but these look so good I have to try asap! These look amazing Aimee! Cheesecake and cookies together is a slam dunk in my book! Perfect! It’s like my favorite cookies and my favorite desert put together! Love Philadelphia, there is nothing like it! Oh my- I’m in love! I like cheesecake in bars, makes it easier to eat! 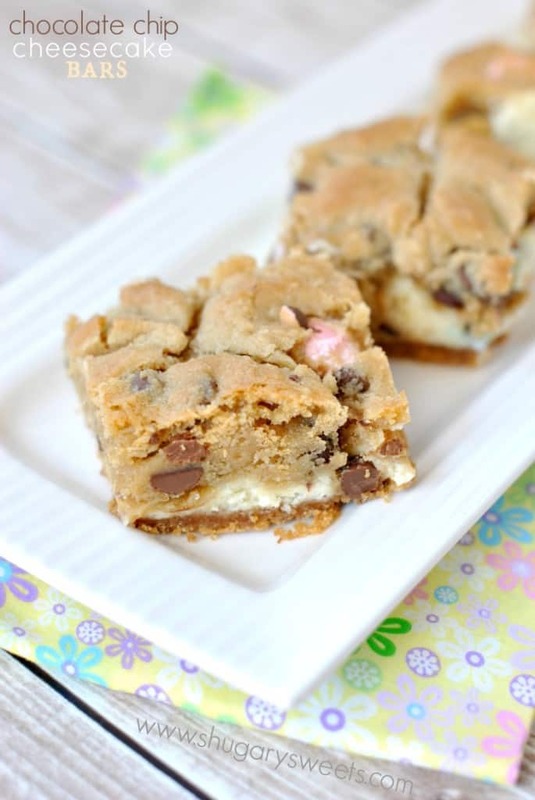 Serious amounts of DELICIOUS happening in these cookie bars!!!! So beautiful! I definitely feel a vegan version of these coming over me! This is nothing better than the chocolate chip cheesecake combo!! Have a great day Aimee! Oh my Aimee! These look so scrumptious…my sweet tooth just kicked in! These look so tasty! I love cheesecake in bars! Thanks Julia, I’m a big fan myself!! Anything with cream cheese and I’m there. These look so yummy! What would you suggest replacing the candy coated chocolate eggs with if I can’t find them this time of year? Everyone in my house loved it! Thanks for sharing the recipe! Love the balance of soft and crunchy in these bars; they look and sound delicious! These bars were so easy and delicious, can’t wait to make them again! 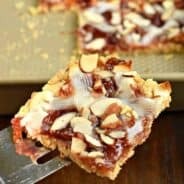 My kids LOVE these bars and they’re so easy!